Clonmore is one of Carlow’s most important early Christian sites with a wealth of history for visitors to discover. 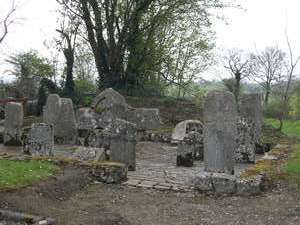 The present road cuts through the monastery founded by St. Maedóc around 600 A.D. No traces of the monastic buildings remain but the importance of the site is attested by the presence of two large crosses, nineteen cross-inscribed stones, an ogham stone and two bullaun stones. 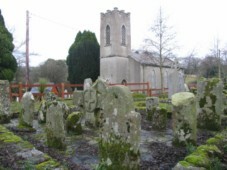 The monastery of Clonmore flourished from the seventh to the eleventh century and at least six saints were associated with it. As well as St. Maedóc (also called Mogue), these included St. Fionnán Lobhair and St. Oncho who is said to have been buried in the cemetery along with a substantial collection of relics. The monastery was an important pilgrimage site and it also attracted less welcome visitors in the form of Viking raiders who attacked the monastery on Christmas night 836. In 1040, Clonmore was plundered by Diarmait Mac Máele-na-mbó, King of Uí Chennselaig, as part of his campaign to gain control of Leinster. Following the arrival of the Anglo-Normans in 1169, Clonmore became a manorial centre and an earthwork castle (motte) and stone castle were built here. The monastic church may have become the medieval parish church and occupied the site of the present simple three-bay Church of Ireland church erected c.1812. The West Cross, also known as the Mission Cross and Mogue’s Cross, stands close to this church in the graveyard on the north side of the road. The shaft and head are composed of a single piece of granite standing over two meters high. 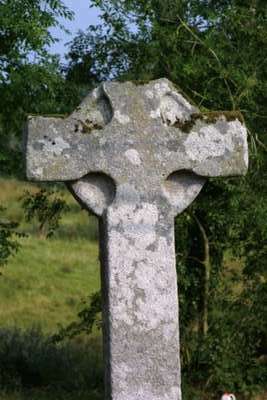 Across the road the shaft of another cross stands in the centre of the graveyard while the head can be found in the right hand corner, fixed into the ground along with a large collection of slabs and cross-inscribed stones. This cross head has a solid wheel on both faces, decorated with small wheeled crosses in medallions in relief at the centre of the wheel. Clonmore houses a fascinating collection of crosses featuring exceptional examples of craftsmanship including one very unique piece. This unusual slab dated to the ninth or tenth century with a distinctive ‘tree of life’ motif is situated at the back, on the right. This can only be seen properly in certain lights and is made difficult by the presence on the stone of much later inscriptions. It is possible that the decoration may have been copied from a piece of continental metalwork and it is an indication that this inland monastery had far ranging contacts. St. Mogue’s Well is now protected by an enclosure and surrounded by a pleasant garden area through which a stream runs. Look out for the fine tripled-holed bullaun stone nearby at the side of this stream. In recent times a movement of people in South East Ireland have endeavoured to breathe life into an age-old tradition of socialising, music and fun. The “House of Song and Story” in Clonmore is an attempt to revive what was known in the past as ‘The Rambling House’ where people would gather of an evening to discuss local events, share stories and listen to music played by the gathered musicians. 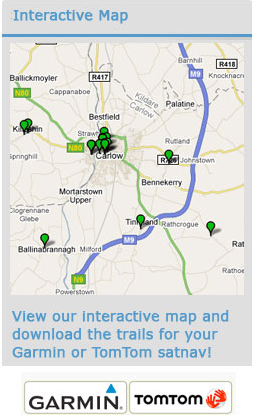 For details of upcoming events visit www.carlowtourism.com. Parking: At nearby pub in the village centre. Ogham stone: Stone bearing inscription in ancient Celtic alphabet comprising straight lines. Bullaun stone: Stone with man-made circular depressions usually found near early church sites. Various functions have been suggested for these stones, some ritual and some associated with metal-working or grinding of corn.